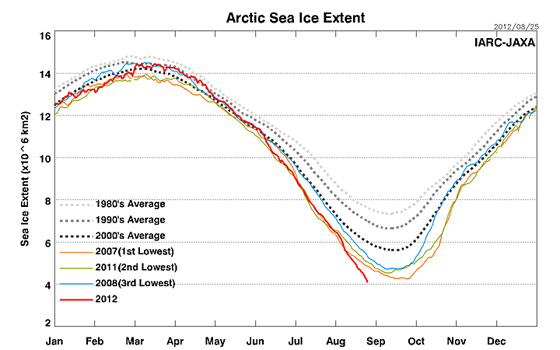 And according to the latest report from the National Snow and Ice Data Center (NSIDC), the extent of the Arctic sea ice in the first two weeks of August was below the record low daily ice extents registered in 2007 and by August 13, “ice extent was already among the four lowest summer minimum extents in the satellite record”. The report states that there was a rapid ice loss between August 4 and August 8, which coincided with an intense storm in the Arctic Ocean. Yet, an Obama aide on Thursday told The Hill that climate change would not surface as a main campaign topic, saying President Obama’s positions on the matter are well-known.